What is an Advanced Placement Program? The Advanced Placement program provides alternatives for high school students in the United States and Canada. The program is also available in schools overseas. The standard high school program usually takes four academic years although many seniors only need two more credits to earn a high school diploma in their final year. Seniors need four years of English, and they rarely get the chance to take two years at a time. In addition, the American government is usually only open to seniors in the fourth year of their high school career. Consequently, during their senior year, they only have two requirements left. In other words, these energetic people have five or six blocks in their schedules that they fill with options. The options are often easy courses with little attraction for most young people. The Advanced Placement program offers juniors and seniors options to fill their schedules more productively. The classes are rigorous and the program provides an option to take an external examination for college credits. How does it help to get accepted into top American or Canadian universities? The College Board, which also administers the Scholastic Aptitude Test (SAT), created the Advanced Placement program with college-level content. External, impartial examiners prepare score and award credit on the final exams. Students receive a grade from 1-5 on the exams. The highest score equals a recommendation of extremely well qualified to the lowest which equals no recommendation. When they matriculate, students may submit their records to their college or university for college credit or advanced placement. Many colleges and universities in the US and Canada recognize the achievement of Advanced Placement students, but the standards for credit vary. Some institutions award credit for scores three and above while others only award college credit for a score of five. Students and parents should check on college policies as they submit applications. Parents could save a full semester’s tuition if their youngsters obtain college credits while still in high school. The Advanced Placement program currently offers more than thirty courses and exams. Advanced Placement English is the most popular offering, and students with the appropriate scores usually receive college credit to avoid taking Freshman English in their first year of college study. According to the latest statistics provided by the College Board, more than 400,000 students worldwide sat for the English language examination in 2013. The College Board also reports that almost 4 million students took individual exams. Students receive credit based on their scores. The Advanced Placement is not appropriate for all high school students. The coursework is more rigorous than most high school courses and failure to score a three grade or above will not result in college credit, so parents might waste their money on exam fees. Some senior students enjoy and benefit from a reduced workload. They might need a break before starting on their tertiary education. Parents and students should meet with the school guidance counselor to choose a schedule. The Advanced Placement program has advantages for many students, so all juniors and seniors should consider enrolling in the program. They should weigh the advantages and disadvantages before committing the necessary time and money. Which schools propose the Advanced Placement program? Most American schools propose the Advanced Placement program. 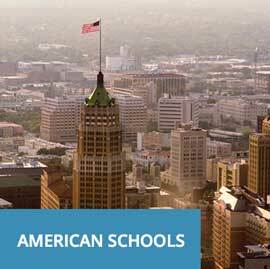 In order to find an American school in your country please use our advanced search tools.